Insights derived from Responder Business Intelligence are designed to ignite action that effects change. By seeing where they are and comparing it to where they’ve been, staff will have a better understanding of what they need to do to get where they need to go. Responder BI’s charting of trends can illustrate the path to a healthier bottom line. The sooner an issue can be identified and analyzed, the sooner remediation can begin. Responder BI can track trends in real time, providing an immediate view of what’s happening and which factors are making an impact – positive or negative. Move faster and smarter to prevent problems from getting worse before they get better. Want to pilot a new initiative in a unit to see how it improves effectiveness? 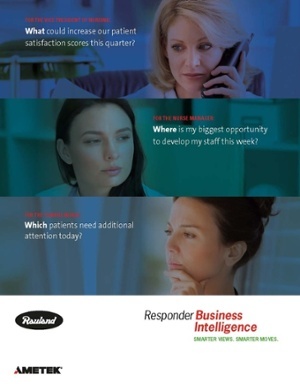 Responder BI provides the perfect platform to compare your pilot program to business as usual. Responder BI can also create a simple feedback loop that helps staff track compliance when implementing a new protocol. Enormously flexible, Responder BI can integrate with other systems in the hospital, pulling in complementary data for a true big picture approach. Data screens are completely customizable, making it easy for each stakeholder to find the details they need to effect change.